The Lucy mission will travel to six Trojan asteroids and one main belt asteroid. No other space mission is history has been launched to as many different destinations in independent orbits around the Sun! Lucy is slated to launch in October 2021. It will first fly by the Earth for two gravity assists before it begins its journey out to the Trojan Asteroids. On its way out to the Trojan asteroids, Lucy will travel through the main asteroid belt and fly by its first asteroid on April 2025. It will fly by (52246) Donaldjohanson, an asteroid that the Lucy team named after one of the co-discoverers of the Lucy fossil. The Lucy spacecraft will continue outwards in to the leading swarm of Trojan asteroids, the L4 Trojan swarm. This is also known as the “Greek camp” of Trojan asteroids as most of the asteroids in this swarm (other than the Trojan “spy” Hektor) are named after Greek heroes around the time of the Trojan war. Lucy will fly by four of these “Greek” Trojans: (3548) Eurybates in August 2027, (15094) Polymele in September 2027, (11351) Leucus in April 2028, and (21900) Orus in November 2028. The spacecraft’s orbit will then take Lucy back towards the orbit of Earth. 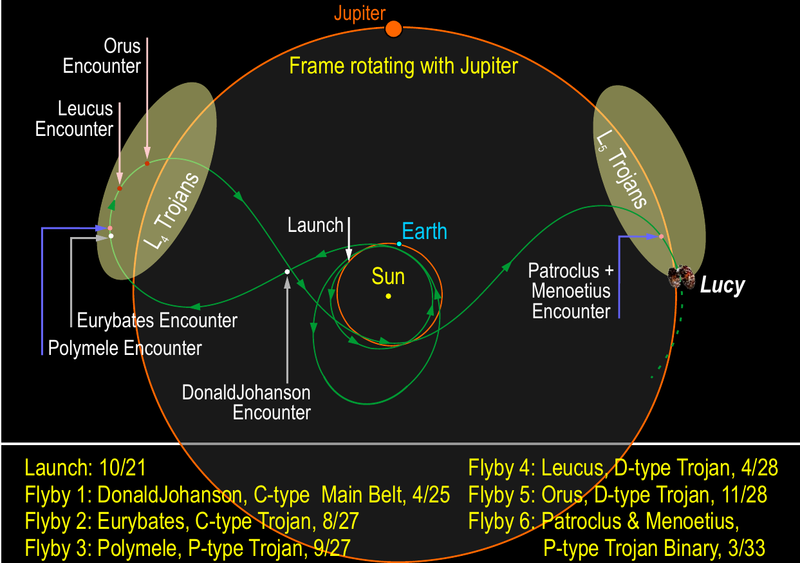 When its orbit takes the spacecraft outwards again, Jupiter and the Trojan swarms will have rotated so that the spacecraft will pass through the trailing L5 swarm of Trojans Asteroids, otherwise known as the “Trojan camp.” Here, on March of 2033, Lucy will fly past the Greek “spies” in the Trojan camp, (617) Patroclus and its binary companion Menoetius. The flyby of this binary asteroid pair will be the grand finale of the mission. However, Lucy will be on a stable orbit and can continue flying through the Trojan swarms for many years to come. The trajectory of the spacecraft. The spacecraft is in red, the Earth and its orbits are in blue, and Jupiter and its orbit are in green. Each target is named as the spacecraft flys by and will change from white to gray after the encounter. The trajectory can also be looked at in a frame rotating with Jupiter. The spacecraft is in red, the Earth is in blue, and Jupiter is in green. In this view, the planets' orbits are represented by bands that indicate the minimum and maximum distances between the planet and the Sun (also known as the perihelia and aphelia).